The weather has been really hot and humid with only one rainstorm in the last two or three weeks. It’s just way too dry. It really takes a toll on my appetite. With that, I’ve been thinking snack foods lately. I went to pick up a few things… ha ha ha I ended up buying everything I need for snaking meals. I bought, among other things, a jar of pimentos, two pounds of Velveeta cheese, a block of sharp cheddar, and four pounds of chicken wings! Last Wednesday was to be our snacking good dinner. [wink] I planned on making the pimento cheese spread, mom’s hot wings, and some popcorn chicken that was part of our Angel Food box this month. Of course that was also the day we got a much needed rain. In fact, it was a bad rain storm; one that flooded the roads in about thirty minutes and knocked out the power, cable, and internet! On top of that I had a meeting to attend at 7:00pm that was supposed to be a short one. Oh right, the meeting ended at 9:10pm but that didn’t stop me, I just had to have some pimento cheese spread. Am I the only one who has these crazy food cravings? Cut Velveeta into chunks. Put Velveeta in a food processor and pulse two or three times to form small chunks. Combine the remaining ingredients in the food processor (or blender) except vinegar and pulse until well blended. Remove to serving bowl and add the vinegar a little at a time while stirring. Add about ½ tsp fresh ground black pepper and taste. Add more vinegar or pepper to taste. Cover and chill in the fridge. Serve on whole wheat bread or with crackers on the side. Wash chicken wings and pat try. 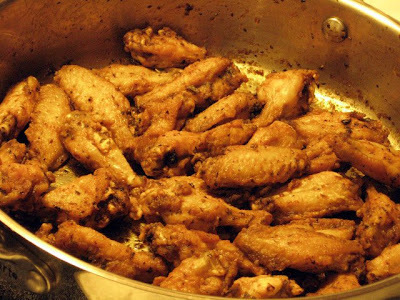 Next, fry chicken wings until crisp. 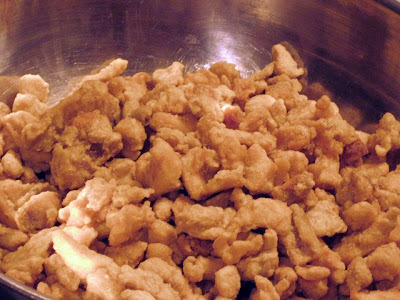 I used my electric turkey fryer and fried them up in one batch. Prior to owning this appliance, I would fry the chicken wings in batches in a deep frying pan or kettle. When the wings are done drain on paper towels while preparing the sauce. For the sauce, I use a large chicken fryer pan. Melt butter over low heat. Add the vinegar and hot sauce and mix until all the liquids have blended thoroughly. Sprinkle the sauce with the Italian seasoning, stir and cook for one or two minutes. Add the chicken wings, stir and toss to completely coat the wings. Cover and cook for about five minutes on low. Serve with blue cheese or ranch dressing. Oh, I almost left out the package of battered Popcorn Chicken from Angel Food Ministries. I fried those up while I was making the spicy chicken wing sauce. I was thinking about making them spicy too but later decided to serve them naked, with the dressing. 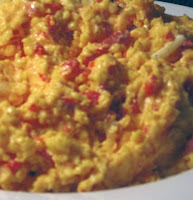 Pimento Cheese Spread – Do not drain the pimentos. This can be done by hand however the food processor makes it more uniform and just the right chunky, creamy consistency. I added the mayo two tbsp at a time and pulsed between additions. Wings - It really doesn’t take much hot sauce to make these hot. It’s the combination of vinegar and hot sauce that does it. 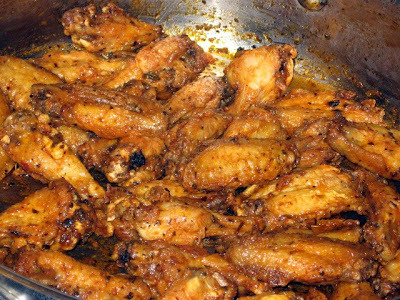 Don’t leave the wings covered for more than five minutes otherwise they will be too soft. OH YUM! I LOVE pimento cheese! Are those the wings you actually cooked? Mine never look THAT good! Kate, you are too kind! Actually they are my wings. Frying first is the key. YUM! I usually bake them so that's probably the problem. This is perfect for my company that's here. Great recipe. I could give that cheese spread a try...really.